2nd Annual Bark at Noah’s Ark – Noah’s Update! 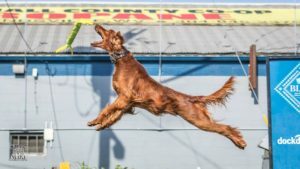 After much anticipation, the Bark at Noah’s Ark Fundraising Team (we affectionately call ourselves the Bark Brainz) is EXCITED to announce that the DockDogs Community greatly exceeded the goals for this year’s event! With combined efforts, over $12,000 were raised for Noah’s Trust fund, doubling the total previously contributed at the 2017 event! The 3rd Annual Bark at Noah’s Ark is set for May 3rd -5th, 2019. Mark your calendars now for this must attend event! For event updates, follow the Bark at Noah’s Ark Community page at https://www.facebook.com/BarkAtNoahsArk. 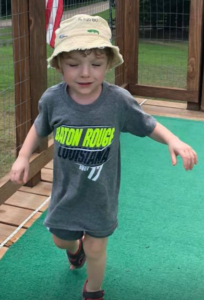 While the “Bark Brainz” primary focus is organizing the Bark at Noah’s Ark event, our mission is to support Noah by securing his future, and meeting his current needs. 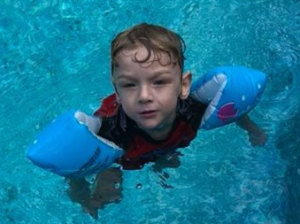 During one of his recent appointments, it was revealed that Noah’s test results range on the Autism Spectrum. Jay and Deb, Noah’s guardians, have taken this diagnosis as a source for positive change in Noah’s life. In addition to the ongoing support of The Bark at Noah’s Ark Fundraising Team, Noah will now have access to supplementary resources and programs. We are delighted to share that Noah started school on July 9, 2018! Despite all of our success and the brightness that the future shines, a bit of light was lost in the process. It is with deep sorrow we share that Jay, Deb, and Noah lost a hero in their lives. Jay’s beloved neighbor, Mark Oldham, passed away on May 25, 2018. Mark attended both events in 2017 and in 2018, as he loved watching teams on the Noah’s Ark Dock. 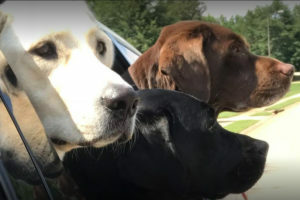 As property owners next to Indian Creek K9 Aquatics, Mark and his wife, Kristy, graciously allowed competitors and spectators alike to utilize their land for camping and parking during the Bark at Noah’s Ark DockDogs festivities. Mark is and will continue to be greatly missed; we cannot thank his family enough for their dedication and their ongoing support. It is often said that one person can make a difference…We, the Bark Brainz, continue to believe that we face this world Two by Two. We never go it alone.